Saturday Evening I returned to Bridgeport, CT after being there almost ten years earlier for a visit to the Arena at Harbor Yard (now called Webster Bank Arena). It was only my 14th stadium and I want to get back this time for a Sound Tigers game. The review needs cleaning up and I keep progressing through that project. Anyway, I digress…the ballpark was the focus of my trip as I was there to check out the Bridgeport Bluefish in an Atlantic League game at the Ballpark at Harbor Yard. I hopped off I-95 to the South End of the city and forked over the most I have payed for parking at a Minor League or Independent game to date: $7. I’m curious if anyone has seen parking prices higher anywhere else. The rest of the prices at the game were average thankfully. I took in the exterior design (which is rather strange and blah) and then read info on a nice statue for James Henry O’Rourke. The biggest thing with this ballpark is the view in right field. It’s not the Harbor as the name may imply, but instead the setting is dominated by a power plant for PSEG. 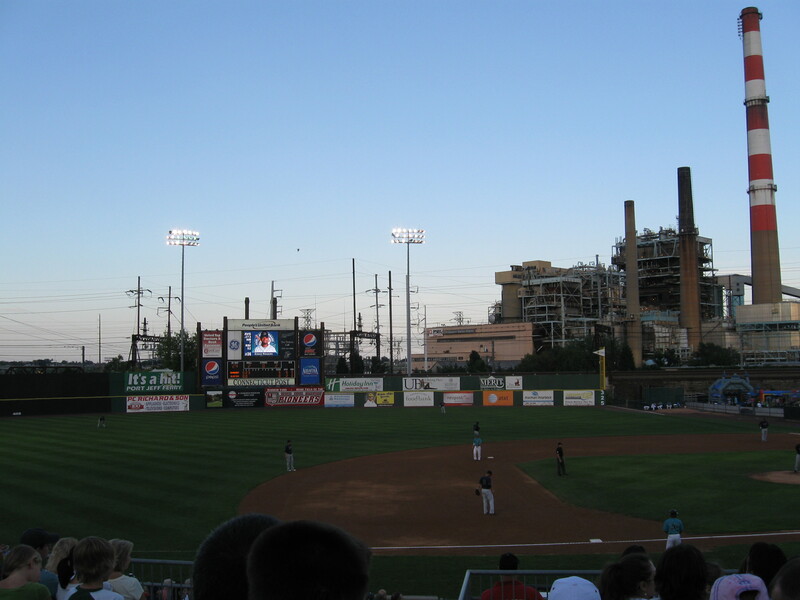 The station, along with its accompanying smoke stacks and the surrounding power poles and wires makes for an ugly backdrop if you are sitting on the third base side. Trains pass by, but that wasn’t enough for me to forget about what loomed behind it. It kind of reminded me of that scene in “Naked Gun 2 1/2” where Hapsburg is showing a commercial of a family in a nice barbeque and the camera zooms out to show the Power Plant in the background. In most cases, I am absolutely for ballparks being designed and modeled after the city that they are in. Given that Bridgeport’s history is industrial and that really is the fabric of the city, some argue that this setting is nice and representative. Sorry…I didn’t see it that way at all. On rare occasion, using the fabric of your city as a core design element may not be the best idea. As for the rest of the stadium, it was a typical Atlantic League ballpark, but credit should be given in that this was one of the first of ALPB’s stadiums. The wide walkway creates a disconnect between seating levels and the upper seats are a little too shallow for my liking. Otherwise, the design is fine. It was nice to see a relatively decent crowd here as Bridgeport struggles for decent attendance. Like Newark (a former Atlantic League team now playing in the Can-Am League), this is another large city that the fans somehow don’t support well. I don’t know what the explanation is, but I would think larger markets would draw larger crowds, but that doesn’t seem to be the case in Northeast independent leagues. About half the place was full on a gorgeous Saturday Evening that had fireworks. Unfortunately, the Bluefish didn’t show up. An error-prone game led to an 8-2 defeat as Somerset had three home runs. The lowlight (forward to 3:42:30) was the awful play by Luis Rodriguez in the bottom of the 9th. As Shea Hillenbrand hit a long fly out, Rodriguez (who was on first) headed halfway to second. After the ball was caught he looked at it for a few seconds and then lazily headed back to first to tag up, only to be too slow and get caught for the second out. That will likely wrap up the baseball season for me…Special thanks to Paul Herrman on the visit. Coming up rather soon is football and there are some places already planned for starting with Columbia in September and then a trip to Wisconsin in October that I’m really looking forward to.